Toronto, Ontario--(Newsfile Corp. - July 17, 2018) - Palamina Corp. (TSXV: PA) has completed further staking to increase its title and application mining exploration rights to 18,900 hectares at the Bendi Gold Project in the Puno Orogenic Gold Belt (POGB) in southern Peru. 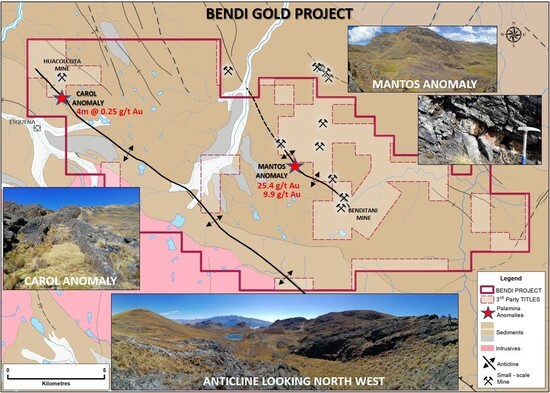 The new staking was based on Palamina's current understanding of prospective geological structures in the Benditani Mine district and their relationship to historical and current operating small-scale gold mines in the area. Staking focused on covering 2 district-scale structures identified by Palamina's field work. 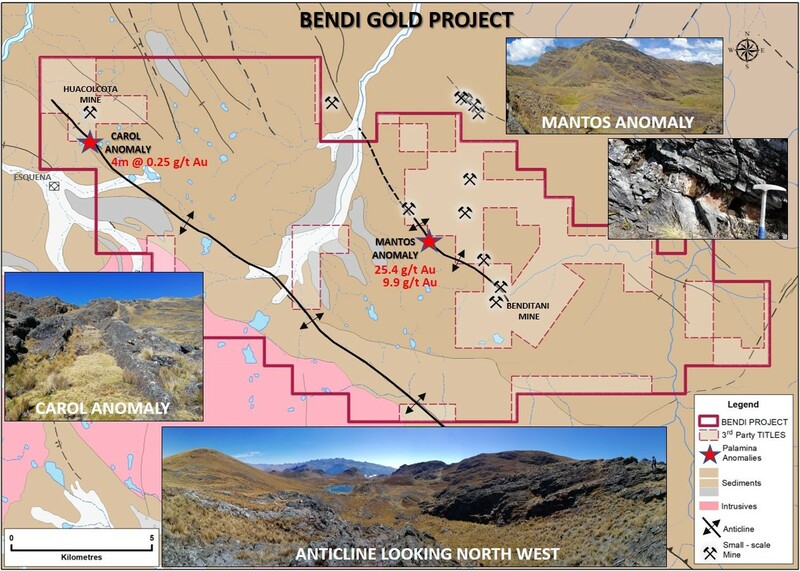 The first a >7 km long thrust-related shear-zone occurring sub-parallel to the Benditani mine structure along which Palamina reports chip samples returning 25.4 and 9.9 g/t gold at the Mantos Gold Anomaly. The second a 15 km long, sub-parallel NW striking structural corridor developed in the core of an anticline. Palamina has discovered an area of anomalous gold along this feature — the Carol Anomaly which returned 4 metres grading 0.25 g/t gold in chip samples collected south-west of the third party Huacolcota producing mine. Andrew Thomson, President of Palamina stated, "Palamina continues to focus on acquiring and securing exploration mining rights to district scale gold projects within the POGB with a view to 'shadow of headframe' exploration where no headframe exists. Palamina's portfolio of properties within the POGB have been ground-truthed by informal miners where little to no systematic exploration and no drilling has been carried out. Palamina´s efforts in the POGB are directed at making a major gold discovery." The Benditani mining district dates back to Pre-Inca times. More than 10 small-scale mining operations are currently in production and there is evidence for over 20 orogenic gold mineralized occurrences in the district. Aside from hard-rock mining activities, alluvial gold-mining also takes place in the nearby Inambari River and its tributaries. The open-ended 150 m long x 50 m wide Mantos gold anomaly is associated with a > 7 km long, Andean-trending compressive shear-zone resulting in the siltstones and sandstones of the older Sandia Formation locally unconformably overlying the slates and siltstones of the younger Ananea Formation. Tectonic compressive-deformation events resulted in NW-SE trending shear-zones, thrust faults, and synclinal and anticlinal folding with minor incidence of NE-SW trending faults, which in turn also result in additional deformation of the orogenic gold host rocks. The principal mineralized target at Mantos is associated with the western limb of a large anticlinal structure and appears to occur as a discrete package, or 'manto', hosting narrow mineralized quartz veins and veinlets generally oriented sub-parallel to the bedding of the fine-grained sediments, but occasionally transecting across bedding boundaries. Some 68% of a total of 69 chip samples resulted in anomalous Au/As values with the two highest gold assays returning 25.4 and 9.9 g/t gold. The 2.5 km long by up to 30 metre-wide open-ended Carol gold anomaly is associated with a recently identified > 15 km long NW-SE trending anticlinal feature which transects the southwestern sector of the Bendi Gold Project. Some 1.5 km of the principal mineralized target is located over the eastern limb of the anticline and occurs as brecciated orogenic quartz veins and tectonically fragmented and foliated host rocks. Fine-grained Ordovician to Devonian-aged sediments host this anomalous zone (in such environments anticlinal features can provide optimum 'traps' for mineralizing fluids). Mineralization in the brecciated quartz veins occurs as disseminated sulphides with >10% FeO in the matrix of this prospective gold-anomalous 'breccia'. Palamina chip sampling from an outcrop south-west and on strike from the third party Huacolcota producing mine returned a 4 metre width grading 0.25 g/t gold. Follow-up geochemical rock-channel sampling is underway with assay results expected around mid-August. Palamina has secured 5 gold projects in south-eastern Peru in the POGB. Palamina's Peruvian based exploration team having a cumulative 35 years' experience in the POGB. The POGB is one of the worlds least formally explored orogenic gold belts. Palamina's five district scale gold projects now cover 77,700 hectares in the POGB. All have previously been to some extent "ground-truthed" by artisanal, small-scale and informal miners who are generally limited to mining gold from the top 50—100 metres below surface. Mineralized orogenic systems can extend down dip to over 1,000 metres in depth. Palamina continues to drive shareholder value through discovery. Palamina Corp. quality assurance/quality control (QA/QC) protocol is administered on all its exploration projects. Prior to delivery of field samples to the analytical laboratory and with the objective to provide an independent check on precision, accuracy and contamination in the laboratory, Palamina QAQC staff insert blank samples, field duplicates and certified standards into the sample stream. To assure best practice compliance, assay results are only reported once the results of internal QAQC procedures have been reviewed and approved. Mr. Donald McIver, M,Sc Exploration and Economic Geology, a Fellow of the Australian Institute of Mining and Metallurgy (FAusIMM), as well as the Society of Economic Geologists (FSEG), is Vice President Exploration for Palamina Corp. He is a Qualified Person as defined by National Instrument 43-101 and he has supervised the preparation, and compiled and reviewed the geological and technical contents of this press release.